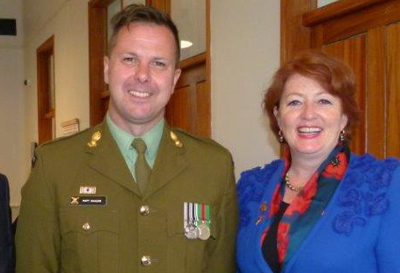 Arts, Culture and Heritage Minister Maggie Barry says the ties between New Zealand and Turkey were strengthened further today with the unveiling of the Turkish Memorial at Pukeahu National War Memorial Park. “It’s fitting that the second memorial to take its place at the park is Turkish as it was Gallipoli where the Anzac tradition was born. Designed by New Zealand artist Gunner Matt Gauldie (pictured below), it features words of reconciliation widely attributed to Mustafa Kemal Ataturk, and a Turkish red pine (pinus brutia) descended from the original Lone Pine at Gallipoli,” Ms Barry says. Ms Barry says the Turkish memorial is one of four planned for Pukeahu National War Memorial Park this year. The Australian Memorial was the first to be installed at Pukeahu before Anzac Day 2015. Minister Barry at the Last Post ceremony held as part of the unveiling.